Skyworks Unveils SkyOne® Ultra 3.0 | Skyworks Solutions, Inc.
BARCELONA, Spain--(BUSINESS WIRE)-- Skyworks Solutions, Inc. (NASDAQ: SWKS), an innovator of high performance analog semiconductors connecting people, places and things, today introduced SkyOne® Ultra 3.0, a highly integrated front-end solution for premium mobile device and smartphone manufacturers worldwide utilizing Skyworks' powerful SkyBlue™ enabling technology for industry-leading efficiency. SkyOne® Ultra 3.0 is a fully optimized front-end system that incorporates all of the high performance RF and analog functionality including power amplification, duplex filtering and antenna switching into a single device. The module integrates low noise receive amplifiers, allowing customers to achieve much better sensitivity levels than previously possible. SkyOne® Ultra 3.0 supports all major carrier aggregation (CA) combinations, meets class 2 high power user equipment (HPUE) requirements and addresses 2.5G/3G/4G handsets for more than 23 bands of LTE. 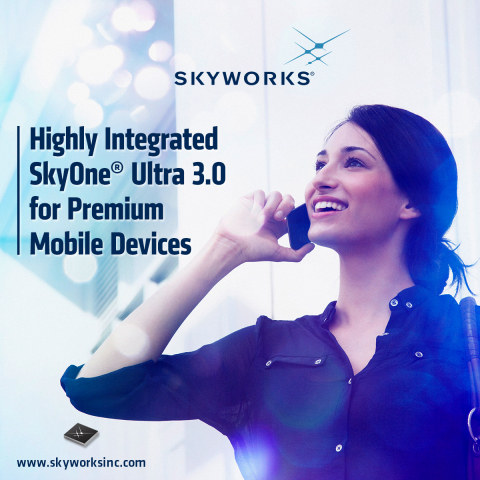 For more information about SkyOne® Ultra 3.0, please contact: sales@skyworksinc.com or visit our SkyOne® web page. SkyOne Ultra 3.0 will be released for volume production in the second half of 2017.